Night sweats are closely related to hot flashes and they are another very representative symptom of menopause. However, just like their daily cousins, they can appear much earlier in a woman's life, being surprisingly common during pregnancy and postpartum periods, and even being noticeable among girls who are just hitting puberty. Continue reading to learn more about the specific causes, symptoms and signs, prevention and management of night sweats. On one study, including both men and women, 41% of patients reported experiencing night sweats at some point during the past 30 days. Up to 85% of women will experience night sweats during the 5 years before menopause. Likewise, 75% of pregnant women report suffering from night sweats. Night sweats, medically termed nocturnal hyperhidrosis, are defined by a sudden raise in the body's temperature during nighttime, followed by an attempt of the body to cool itself down by sweating profusely. Because most people are asleep while they happen, they may not notice the raise in temperature and may sleep through it, just to wake up later to drenched pajamas, wet sheets and body odor. Night sweats are a very common symptom of hormonal fluctuations, which control many seemingly contradictory functions around their bodies. Some women who suffer from extreme varieties of premenstrual syndrome (PMS) -also known as premenstrual dysphoric disorder (PMDD) - experience occasional night sweats during the final week of their menstrual cycles along with many other uncomfortable symptoms. Night sweats are even more common among women undergoing more acute transitional periods such as puberty, pregnancy, postpartum and menopause. Because night sweats are nearly always a symptom of an underlying problem instead of a disease of their own, they don't have a direct correlation or effect on a woman's fertility. However, they may reveal an underlying hormonal imbalance that could influence a woman's ability to become pregnant and influence other aspects of her health. It is difficult to accurately establish the different types of night sweats, since the individual experience of them can be drastically different from woman to woman. However, there are two criteria that can help identify ways in which this symptom may vary from woman to woman: intensity and frequency. 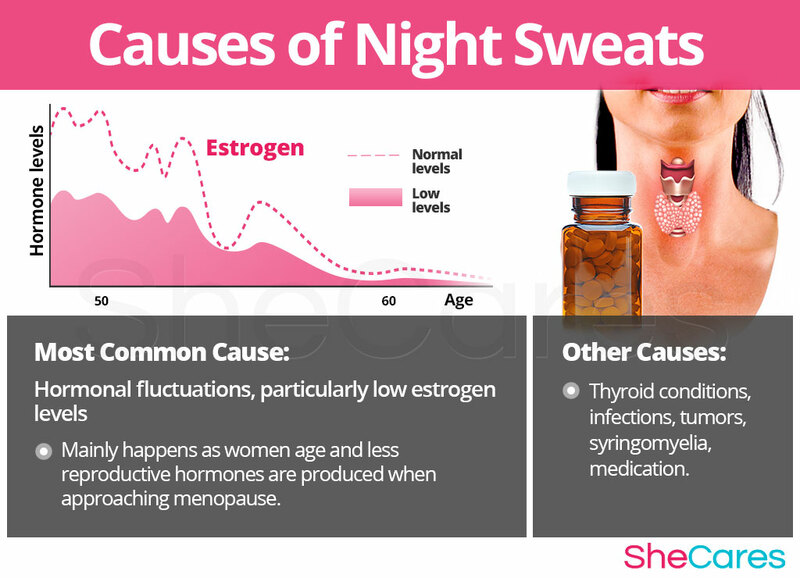 In order to understand the processes behind night sweats, continue on to the next section to read about their hormonal and non-hormonal causes. Another - very rare - cause of night sweats can be gastro-esophageal reflux. This condition involves the leakage of stomach acid into the esophagus, causing a burning sensation that can travel through here and into the throat. It can also cause severe heartburn. Night sweats are an uncommon symptom of this condition; however. Learning about the causes of night sweats provides the key to understanding how to prevent and treat these troublesome attacks. While the exact causes of night sweats are complex and not completely understood, most researchers agree hormonal changes are the primary cause of night sweats. In addition to these completely normal hormonal causes, other factors and medical conditions can, in more instances, cause night sweats. Continue reading to learn more about both the hormonal, and other, causes of night sweats. Hormones are chemical messengers that control every organ in the body. When fluctuations occur, organs don't receive the correct signals to function adequately, so hormonal disorders occur. In this sense, we can say that night sweats are caused largely by the hormonal fluctuations during the transitions women go through during their reproductive life. The hormones estrogen and progesterone influence the hypothalamus, a section of the brain that is responsible for regulating -among others- the body's “inner thermostat”. Although brain regulation and the processes involved is still partly unknown, research has found that sharp fluctuations in the body's levels of estrogen can confuse the hypothalamus, and make it appear as if the body was overheating. In response, the brain sends the signal to cool down by dilating the blood vases and producing extra sweat. Hence the reason why more women experience night sweats during times of significant hormonal imbalance - puberty, PMS, menstruation, pregnancy, postpartum and menopause. The estrogen deficiency during these stages causes the hypothalamus to become abruptly confused and triggers night sweats. If hormone levels are not regulated, women may experience changes in their body temperature and night sweats will start occurring, as well as other psychological and physiological disturbances. Furthermore, there are also specific hormonal causes and environmental factors that can influence a woman's experience of night sweats, according to the stage of her reproductive life. Puberty is the stage in which a girl's body begins to produce reproductive hormones; these changes will come with unexpected symptoms such as changes in body odor that may contribute to the ill experience of night sweats. Pregnancy leads to extreme changes in hormonal production, which along with other factors, like weight gain or sleep disruption, can lead to night sweats. Postpartum and breastfeeding constitute a distinct stage where reproductive hormones become imbalanced, leading to severe night sweats. In addition, fluid loss and the new curves left by pregnancy can also contribute to the disorder. Menopause is the stage in a woman's life when production of reproductive hormones naturally declines, signaling the end of a woman's fertility. It is during this stage of life that hot flashes and night sweats are more characteristic, because in addition of their heightened intensity, they will also be influenced by other symptoms of menopause. While hormonal imbalance is the major underlying cause of night sweats during a woman's life, experts also point out that there are other, more serious but much rarer conditions that can cause night sweats, including thyroid conditions, certain infections, and syringomyelia, among others. Keep reading to learn more about the risk factors and triggers that can easily set off or worsen a woman's experience with night sweats. Some women are more likely than others to suffer from night sweats for inherent psychological, behavioral and health reasons. These predisposing factors can affect a woman's hormone levels and increase the chances that a woman will develop night sweats during her reproductive life. In addition to long-term risk factors, night sweats can also be triggered by certain environmental phenomena and behavioral habits. 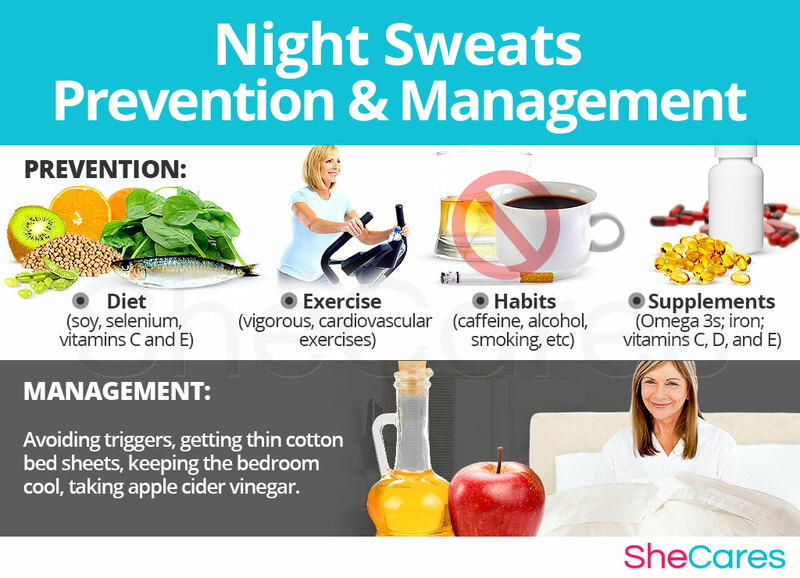 Avoiding these environments or habits as much as possible may help to avoid the onset of night sweats. These include food binges, smoking, eating spicy food or the use of stimulants. Continue reading to discover the symptoms and signs of night sweats to be able to choose a treatment specific to its cause. Because each individual woman has her own habits and customs regarding the type of pajamas or bed linen that she likes to use, each woman will experience night sweats differently and the amount of discomfort they will cause to her life will be very personal as well. 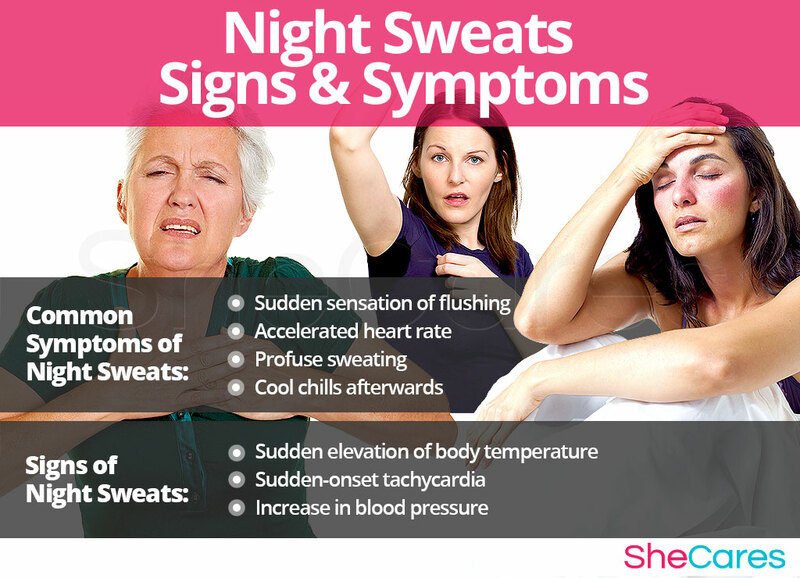 However, the basic symptoms of night sweats are common for all women undergoing a phase of hormonal imbalance. Sometimes, the sweats may be followed by cool chills. Some people may sleep through the previous process and be awoken for the chills. To diagnose and identify night sweats, a doctor must typically perform three procedures. First, they should review the patient's medical history; then, they should conduct a physical exam, followed by some additional tests, if necessary. By themselves, night sweats do not have any serious or risky complications, as they are usually caused by hormonal imbalance. However, in rare cases they may be an alert sign of an altogether different condition, and as such will be accompanied by different warning symptoms. 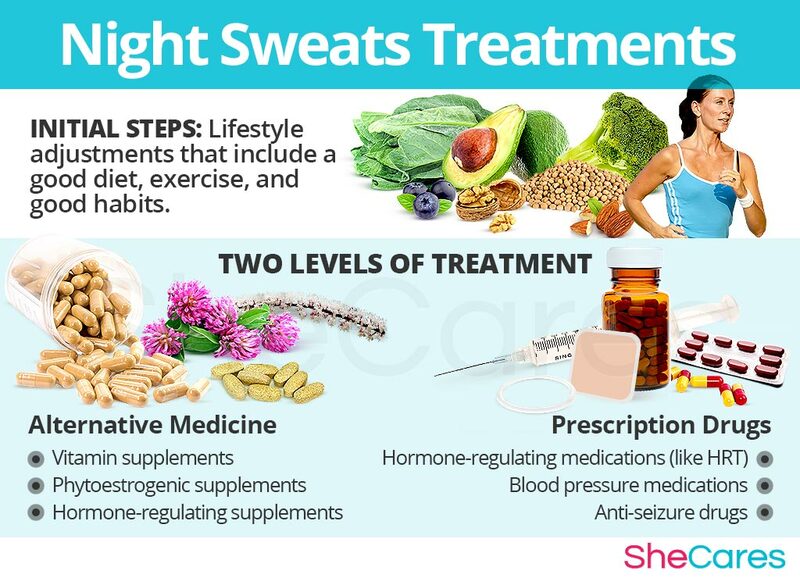 While there is no single way to completely prevent night sweats, just as there is no way to stave off hormonal process, there are a few steps that a woman can take to lessen her chances of developing night sweats, or to minimize the impact or length of time that symptoms occur. In this sense, lifestyle changes for prevention are extremely important, especially with regard to diet, exercise and healthy habits. Moreover, a woman may seek ways to complement these lifestyle approaches with the use of supplements that help to enhance the endocrine system and, therefore, help to prevent or ease symptoms of hormonal imbalance, like night sweats. Continue reading to learn more about lifestyle changes for prevention of night sweats. For women who are already going through the disorder, prevention may not be possible. Fortunately, there are many ways to manage night sweats in order to prevent the “flare-ups” or to ensure they are as little bothersome and mild as possible, making sure daily quality sleep is safeguarded. Keep reading to learn about the different ways to manage night sweats. Unlike hot flashes, that can happen at any point if the day, night sweats will at least be confined to the evening and the bedroom. However, this can be both a blessing and a curse, because they can affect your energy levels throughout the entire day and put a strain on intimate relationships. Fortunately, there are some minor daily changes, such as avoiding triggers, which can make a huge difference for women who are trying to manage night sweats. Furthermore, there are also specific guidelines for managing the disorder that can be followed by women during puberty, pregnancy, post-partum, and menopause. While these measures often help to reduce the frequency and intensity of night sweats, they are unable to treat the root of the problem, which is hormonal imbalance. However, there are several natural treatments can treat the hormonal causes of night sweats. Please continue to the next section to learn more about treating night sweats. To stop night sweats that are a symptom of menopause, many women usually take hormone-influencing medication such as hormone replacement therapy (HRT), or natural supplement like soy and black cohosh. You should talk to your doctor about these treatments before embarking on a course of medication. While natural remedies tend to be considered safer than prescribed medication, they can still have serious side effects especially if they are over consumed. It is important to always adhere to the provided directions, in order to properly benefit from the herb and to avoid any nasty consequences. While they may be mocked as “not a big deal” by people who have never experienced them, night sweats can be very disruptive for a woman's quality of life. Luckily, it is more than possible to find an effective treatment for night sweats. Three levels of approaches can be considered for treating night sweats. These are categorized as: (1) Lifestyle Changes, (2) Alternative Medicine and (3) Pharmaceutical Options. Women are encouraged to begin with the least risky approach to night sweats treatment, lifestyle adjustments. While these are often effective at curbing the disorder, they alone do nothing to address the most common cause of night sweats in women -hormonal imbalance. Fortunately, alternative medicine can be combined with lifestyle changes to provide a safe and effective night sweats treatment. While medical intervention is not usually necessary to treat night sweats, some women may wish to consider drug options if they are unable to find relief from natural treatments. For women considering this option, it is important to understand, and carefully weigh, the risks associated with such types of treatment for night sweats. This primary level of treatment involves the least amount of risk, though conversely it requires the highest amount of self discipline. Many times some simple changes in lifestyle can reap huge benefits in fighting night sweats and achieving a higher overall level of health. Fundamentally, an improved diet, regular exercise and healthy habits can do a woman great service. While these changes will help alleviate night sweats, they do not address the problem directly at the hormonal source and so further treatment may be necessary. Alternative medicine has proven to be excellent for treating night sweats in a safe and natural way. Alternative approaches involve little to no risk and can be an extremely effective way to treat night sweats. This level of approach can involve several different therapies. Supplements are the most prominent, and there are two main types that may be used: phytoestrogenic and hormone-regulating herbal supplements. These supplements, such as dong quai, contain estrogenic components produced by plants that complement the low estrogen hormones in a woman's body, helping alleviate night sweats. By introducing plant-based estrogens into the body, these herbs treat the underlying estrogen deficiency behind night sweats. These supplements can be considered the safest and most natural way to treat the underlying hormonal imbalance behind night sweats, and can be taken throughout a woman's life, as they support the body's natural hormone production. Additionally, there are other types of supplements that can alleviate night sweats, or at least make them more manageable, like vitamin supplements and herbal supplements. A combination of approaches is usually the most effective route to take. Lifestyle changes combined with alternative medicine will most likely be the best way to alleviate the symptoms of night sweats. However, for some women the symptoms will be so severe that a more drastic treatment is necessary. Interventions at the third level involve the highest risk and often the highest costs. Not all treatments are suitable for women at every life stage, so it is strongly recommended to speak to a licensed healthcare practitioner before starting any pharmaceutical treatments for night sweats. The main type of pharmaceutical products that can be prescribed against night sweats are hormone-regulating medication, including Hormonal Replacement Therapy and mood-regulating medication. If a woman's night sweats are at the level of severity that she is still considering this final option, it is wise to speak to a healthcare professional for guidance. These three levels of approaches are not mutually exclusive. A woman may use different approaches at different times or any combination of them, depending on the duration and severity of symptoms. Today more and more women find that dealing with menopause symptoms is best accomplished via a combination of healthy lifestyle and alternative treatments.